Flash drives: ultra-fast. Zero noise. Absurdly awesome reliability. Now, replacing your hard drive. That’s the vision, anyway. Flash memory, once limited to very tiny chunks, is slowly creeping towards storage big enough to use for audio. You’ve already got flash storage around, most likely, because of devices like Apple’s iPod nano and iPhone. But 4GB or 8GB is a little cramped for most audio and music work. You need numbers like 32GB. That’s exactly the size of the drive Dell is putting in its new Latitude D420. But it doesn’t come cheap: the SanDisk 1.8″ drive, while extremely fast and reliable, will have a street price around US$500. So if flash storage is so expensive, what’s the point? Well, for starters, the failure rate on hard drives is very high. Even ignoring the (significant) performance gains in flash memory, it’s worth having a more robust medium, with no moving parts. Second, the sense is that flash costs will continue to fall. After all, there was a time not so long ago when a 20 MB(!) hard drive was a luxury. Of course, the big push on the PC side — and some of the functionality supported in Intel’s Santa Rosa and not used by Apple’s new MacBook Pros — is using flash to store Windows bloat– I mean, uh, cached data and applications. (Okay, let’s face it: all three OSes have become pretty bloated if we’re talking about needing hundreds of dollars of high-performance flash memory just to cut down on endless load times. See Vista’s ReadyBoot and such.) But I think for the music market, the bigger draw could be storing media files. We can wait for the OS and app to load; it’s media file performance that matters. 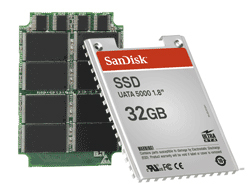 In the meantime, it’s easy enough to become a flash memory convert for other reasons. I’m really happy with my Corsair FlashVoyager GT, the USB key I carry around. It’s limited by USB2 speeds, but I’ve even run audio and video off it live. And it’s comforting just knowing my data is backed up on a reliable medium, and mobile between the various machines I own. (Yes, no matter how great networking gets, nothing beats a little SneakerNet.) Imagine if this thing were large enough to keep all your projects on. And for all the complaints about the small storage size of the iPhone, there’s nothing worse than dropping your iPod and killing the hard drive. So the big question now is, when will prices fall enough that a little musical flash drive is a no-brainer? Thanks to Moldover for the links.